Warm weather is fast upon us here in Northern California, so eating outdoors is the norm. Usually, throwing a piece of meat on the BBQ is the standard, and this weekend was no exception! I actually took a picture of it all on the grill for you, but being the phone dummy I am, I can’t find it. Ugh. I know my way around the kitchen, but I am pretty much a cavewoman when it comes to electronics. That’s why California Girl has to post the blogs for me because it’s all I can do to email her the blog and the pictures! California Girl comments: It’s probably a good thing, you torture me with all of the food pics. I am sure all of our readers will forgive you too. Getting back to this weekend…we didn’t want the usual fare of potato salad or macaroni salad with the BBQ. Everyone said NO to baked beans. So what’s a girl to do? 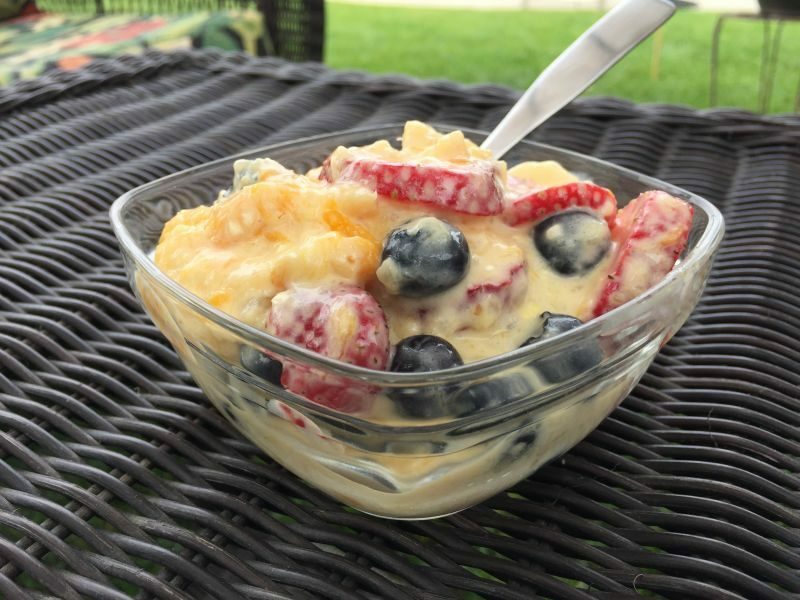 Thankfully, this time of year I have tons of fresh fruit on hand all the time, so I quickly put together a creamy tropical salad and it was a perfect side dish for the BBQ chicken! 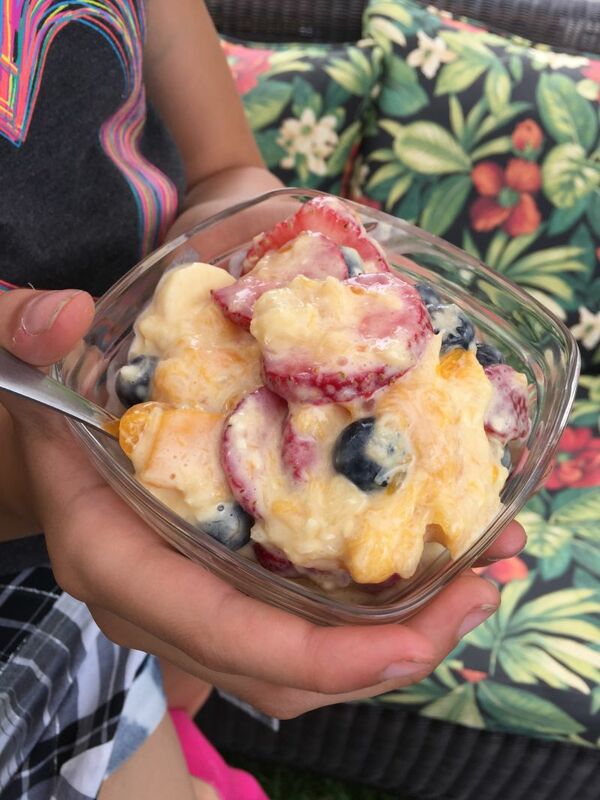 California Girl comments: Looking at the pictures is making me crave this fruit salad. It looks delicious! I am a big lover of coconut so it sounds even better. It’s super easy, and you are going to love it! Make a big batch, because everyone will come back for seconds of this wonderful dish! 1 large can mandarin oranges, drained. 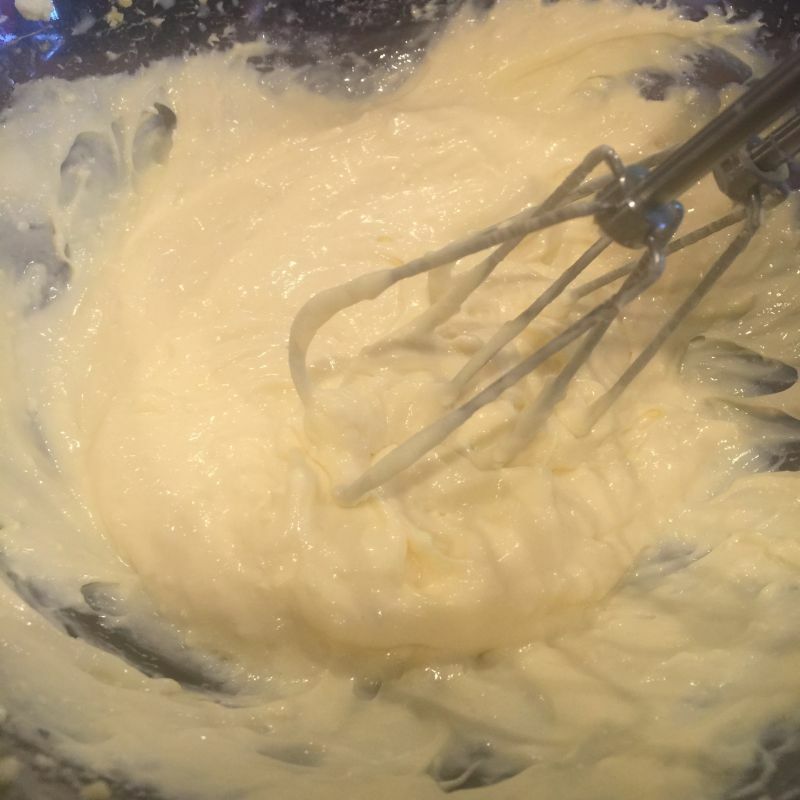 In a medium sized bowl, place the cream cheese block and soften with an electric mixer until smooth. On low speed, mix in the box of instant pudding (dry) and the milk, mixing until nice and creamy. It will be very thick. Set aside. Rinse the strawberries and lay them out on a paper towel to dry. Once dry, de-stem and slice in to relatively thick slices, or cut them in to 1/4’s, whichever you prefer. Peel and cube the mango. Slice the banana’s into 1/2 inch slices. 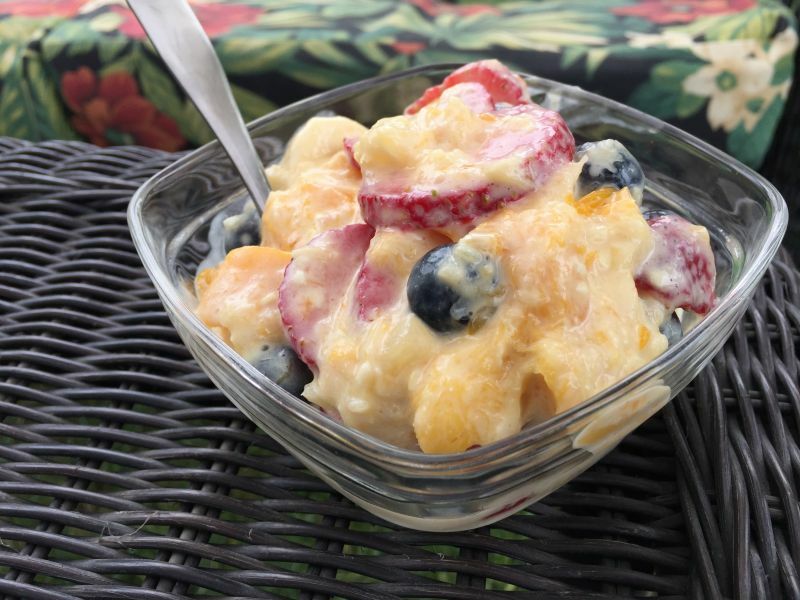 In a large bowl, combine all of the fruit, including the drained oranges and pineapple. Gently fold it all together. 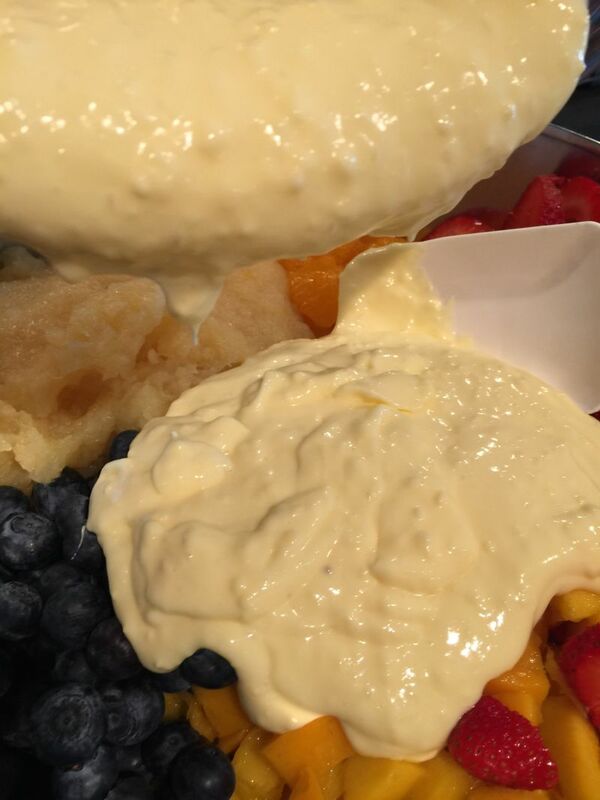 Grab a whisk and your bowl of cream cheese and pudding mix. 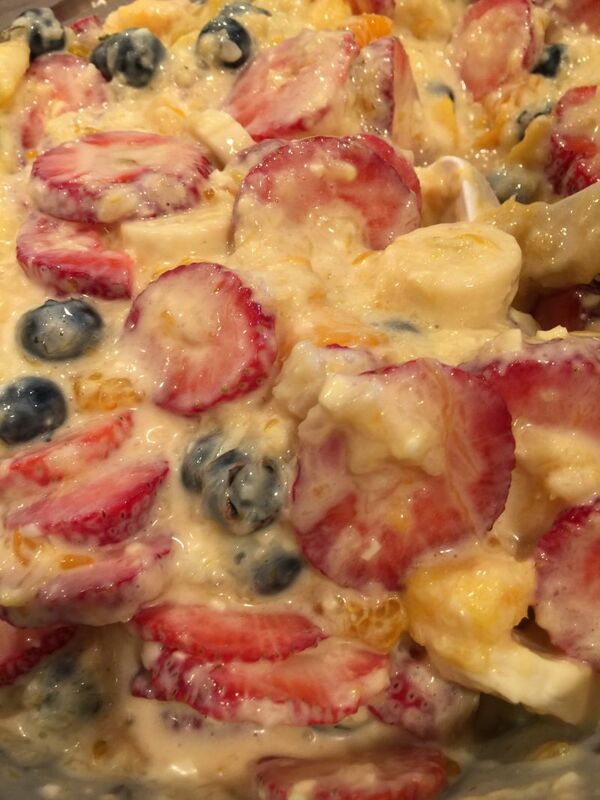 Using the reserved pineapple juice, whisk in enough to make a creamy dressing that is the consistency of pudding. The pictures you see here show a lumpy dressing because I used a coconut pudding. The banana and the vanilla will both be very creamy. 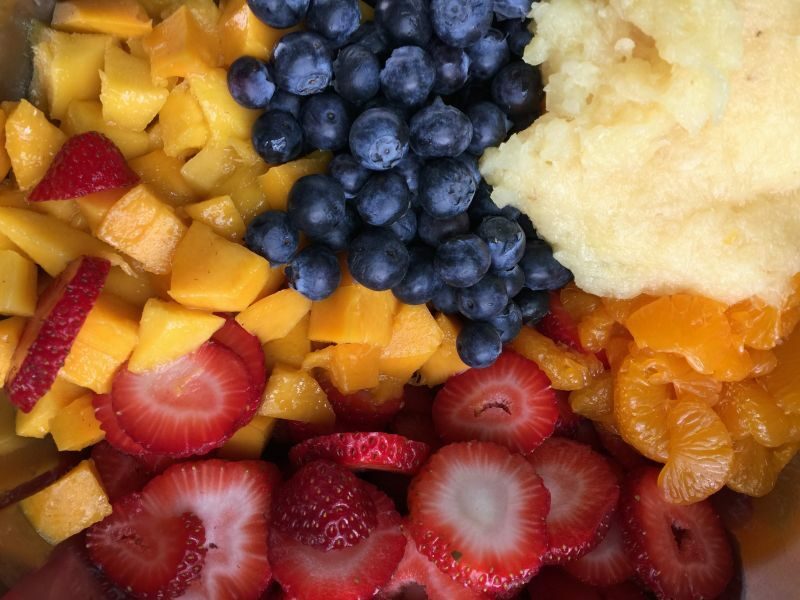 Add this dressing to the bowl of prepared fruit, and gently fold with a rubber spatula. Seriously, don’t eat a lot of anything else because you are going to want second’s of this one.